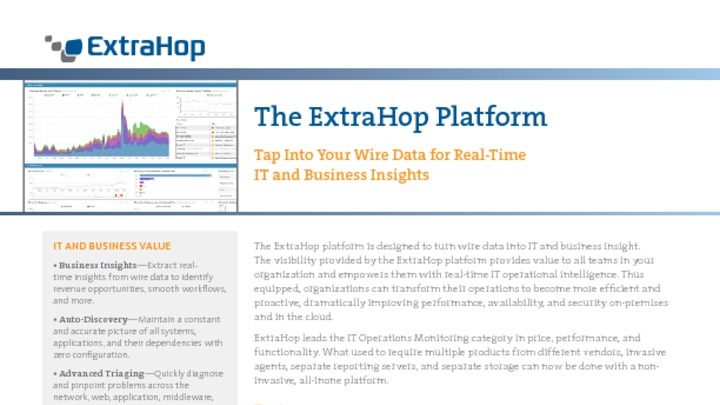 The ExtraHop platform transforms unstructured packets on the network into structured wire data, a new source of real-time business and IT insight. Hundreds of enterprises around the world have adopted this technology to proactively manage application performance, optimize their infrastructure, identify security threats, and analyze business operations. If you could make sense of all the conversations traversing the wire in your datacenter, you could learn a lot about your IT and business operations. After all, everything transacts on the wire. Here's the rub: insights don't just appear from packets on the network. You need to transform those raw, unstructured packets into a structured form—wire data—in order to derive actionable insight. In the past, organizations made sense of packets on the network by recording them and performing offline analysis of those stored packets. That approach does not scale in today's complex and hyperdynamic environments, and results in data that only network experts can understand. It's time for a technology that can continuously transform this flood of packet data into structured wire data so that all teams can benefit.